Great hostel. Staff were really friendly and helpful. Organised a taxi to take us to Iguazu Falls as soon as we got there. Good restaurant recommendations. Nice relaxed atmosphere. Clean facilities and rooms. Loved it here! Perfect convenient location and such a friendly staff. This is how all hostels should be! 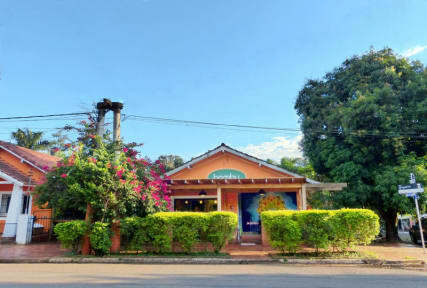 Located very near to the bus terminal, grocery store and some restaurants. The atmosphere is somewhat calm as everybody takes the whole day to visit the falls and Brasil. Bathrooms, rooms and beds are clean. Staff is helpful in telling you about the various trips and activities. Cheers to Manuel at the bar who recommended food and drinks! Had a lovely time here! Staff were super nice Breakfast was delicious Location was great There were adaptors so you don’t need to bring your own, the staff helped out with transportation, trips and suggestions. Atmosphere was lovely - No regrets! Highly recommend!!! - bring towel and bug spray!!!! Great value for money. The rooms are basic, but the highlight is the social bar area. The WiFi didn’t work very well outside of the rooms which was slightly annoying. All the staff were very helpful. Had a really nice stay, staff were lovely and the food was good. Location was great, just few minutes away from main bus station to the falls. Could do with some TLC but had a good vibe. Only concern was we were not being given a key for our room so was left unlocked but there were large lockers to store all our belongings. Would still recommend to anyone. 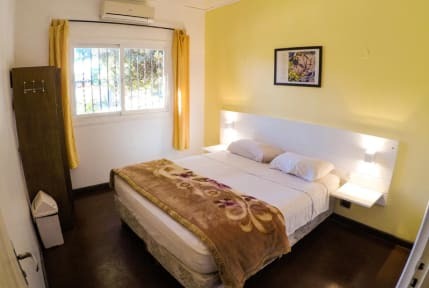 Great location, a few minutes walk to the bus station. Very friendly staff and a nice bar which was a good place to chill after visiting the falls. Dorm room was ok, enough space not to feel crowded. The staff and bar area are great. Good food choices at the bar. Close to the bus station and town. You have to pay more for eggs at breakfast. The 14 dorm is crowded. The showers and toilets need a good clean. The lockers for your stuff are very small. Really nice, chill vibe in the hostel though! The hostel was ok, but not that perfect as the rate in the website was. All in all the stay was good and with the bar in the hostel was the community very good and the staff was very friendly. Only one thing was not ok. When I arrived I had not clean laundry in the bed and I told them to change it. But they said just it is fresh and didn’t change it. The bathrooms cold be also more cleaner.